Two writers, separated by a continent, and committed to very different concerns, are united by one factor: their undeniable presence in the literary world. 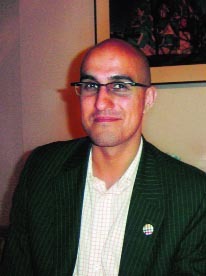 Hari Kunzru, in the UK, and Rupa Bajwa, in India, might appear to have little in common but for the stir they have created in the publishing world. 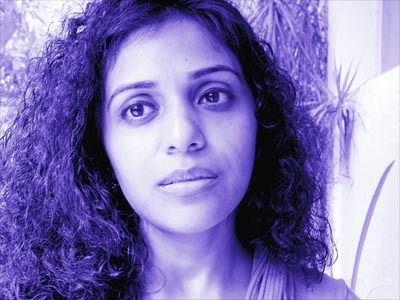 Both in India and abroad, Indian writers writing in English are making news as much for the appeal of their works as for the amounts they are paid. Although Kunzru’s macro take on issues like colonialism, globalisation and immigration finds nary a reflection in Bajwa’s almost Jane Austen-like micro impression of the world, both have hit the jackpot. Kunzru’s second novel, Transmission, is expected to equal, if not exceed, the popularity of his first, The Impressionist, while Bajwa’s debut The Sari Shop has got an enthusiastic reception. As Salman Rushdie, Vikram Seth and Amitav Ghosh, among others, move over to make way for fresh talent, here’s to the Gen X of Indian English writers. What is it to be a Punjabi girl writing in English? Being a ‘Punjabi Girl’ certainly didn’t make things easier. Neither the Punjabi bit nor the girl bit. I could ask myself this question forever and still not understand it fully. It is slightly complex. The language aside, the mere act of writing can be made very difficult by circumstances. I was born and brought up in Amritsar which has only one bookshop (excluding the ones that sell textbooks and a few works of non-fiction). Isn’t that strange for a big city like Amritsar? The environment is hardly conducive to reading and thinking, let alone writing. Elsewhere, outside Amritsar, outside Punjab, people my age were moving so fast that it made me breathless sometimes. I had to disappear into a vacuum to write. For me personally, there was no precedent, no infrastructure and no sense of possibility when it came to writing. I had to learn to stay in solitude and work hard. I was living alone in a series of rented rooms in different cities, working on rented computers, keeping no stable job for long, refusing to marry. You cannot easily escape the pressures from the part of society you come from, though you can learn to deal with them firmly. I won’t go into whatever is involved in writing in English for Indians, because I don’t have anything new to say. I would just be repeating the same things about multilingualism, class, etc. I love writing. I had written a few short stories a few years ago. One of them was about this shop assistant who works in a sari shop. The idea and the character stayed with me but I wasn’t satisfied with the story. So, I kept working on it. Soon I realised that I would have to change it to a longer narrative if I wanted to complete it in my head. Were your short stories published earlier? I have never shown them to anyone. I think they need a lot of reworking, which I can’t do at present since I am working on the second novel. I find that working on short stories really disciplines your writing. I don’t have an option. I write because I need to make sense of the world around me. I also have curiosity, passion, anger, uncertainties and certainties. All this goes into writing. I write to preserve my sanity, just to live. I also enjoy the whole process, even though it requires hard work. I don’t think it is autobiographical, but yes, it is very much about the society as I have seen it. Bits of you always creep in, sometimes without you being aware of it. Where did you write the book? How long did it take you to write it? I wrote the novel in different cities, and it took me a few years. I can’t say how many exactly because initially it was written in fits and starts. Then I spent almost nine months just working on it full time, about 12-15 hours a day. You have mirrored the hollowness of the so-called intellectuals but not dwelt on it. Why? I guess that is just the way I write. I prefer to keep my opinions to myself while writing fiction and allow the characters to take over the story. Was it necessary to make Ramchand conform to his old routine in the end? For me, it was the natural turn of events. Ramchand’s character is such that he could not break out of his boundaries. The idea was not to have Ramchand and Kamla fighting the system and coming out as winners in the end. The idea was just to try and understand them, and to understand everything else around us. In our complex society, it is really not easy to change the world, or even part of it, or even our own life sometimes. You have shown Kamala opposing the patriarchal system. This is a novel that just tells a story. I write about the world I live in as I see it. There are supposed to be no morals. I have just tried to paint as true a picture as I could. The idea was just to understand the world we live in. Kamla actually never even thought articulately about patriarchy. The word patriarchy does not really exist in her language. It is just her character that makes her who she is. She just lived as well as she could and broke down when she couldn’t handle it anymore. I still think she was a brave woman. It is a novel. I am nearing the end of the first draft but run into difficulties every second day. I don’t know how long it will take me to finish it. Sevak Sari House in Amritsar becomes the backdrop for unfolding the story of the 26-year-old Ramchand, a shop assistant. He is the pivotal character, around whom the plot is weaved. The narrative is simple, precise and the prose uncluttered. The book is engrossing and the characters true to life. There is an accretion of details. 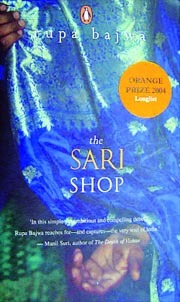 The description of the alleys of Amritsar and the red-lettered signboard on the sari shop shows the writer’s skill in expressing minute details. The nouveau riche and the pseudo-intellectuals come in for some harsh treatment. The shallowness of their lives and the mercantile brutality that has overtaken their relationships is documented with wit. Through characters such as the upwardly mobile and shrewd Mrs Gupta, the acquisitive Mrs Sandhu, the haughty Mrs Kapoor and the full-of-her-knowledge Mrs. Sachdeva, Rupa Bajwa shows us the underbelly of urban middle class India. On another plane are portrayed the lives of the lower stratum of society. They have simple pleasures: they like eating hot samosas and burfi with tea, and enjoy dreaming through Bollywood films. Their forthright attitude is brought out through Kamala, wife of Ramchand’s colleague, who dares to oppose the brutality she faces. She is battered by her husband, thrown out from work, raped by law enforcers (policemen) and burned to death by thugs hired by a "respected" businessman. The brutality she faces because she tries to cross the Rubicon is starkly depicted. The price Kamala has to pay shakes Ramchand; he loses his mental balance but soon recovers, to again live a life of conformity, with no questions asked. The obsession of Indians with the English language and how it has become a yardstick to judge a person’s knowledge and place in society is satirised brilliantly. The inadequacy felt by Ramchand for not knowing the Queen’s language, obsession of parents to send their children to English medium schools, the airs of those who discuss post-Colonialism, paradigms of poverty without sensitivity or feeling is succinctly illustrated. The story telling is deceptively simple even as it hides existentialist angst. From being a simple happy child, Ramchand becomes a boy who learns to bottle up emotions. He does not even react to his ancestral inheritance being taken over by his uncle. His brief fight against the constant injustice meted out to Kamala and then again being an indifferent and regular shop assistant is sensitively crafted. Bajwa, who has control over her craft, deserves accolades, as she maintains a balance and never goes overboard. She weaves in a philosophy without becoming philosophical. Her dictum remains ‘every coin has two sides’. Ramchand had been working at Sevak Sari House for eleven years now. He had watched innumerable women choose saris. Though women were otherwise strange, alien creatures to him, there was one part of them that he knew intimately — the way they chose saris. He had learnt to read their expressions and their moods very accurately. He could guess when they were definitely going to buy a particular sari. He could tell when they were in two minds and had to be pushed into buying one. He could immediately sense when they had made up their minds not to buy anything and were just pretending to be interested. Ramchand had learnt to be patient while women talked and pored over a sari endlessly. They would peer at it closely, running their fingers lightly over the fabric, scrutinising the pattern, as if trying to decipher faded handwriting on an old parchment. He had also come to recognise the covetous expression, followed by a resolute look on a woman’s face once she had decided that she must have a particular sari, no matter what happened. But today, in the drawing room of the Kapoor House, there was no bargaining and very few questions were asked. In fact, they did not even bother to ask the prices, even when he unpacked the most expensive lehngas that were available at Sevak Sari House. They exchanged very few words with each other, both women absorbed in picking out what they wanted. They ignored Ramchand completely. They chose expensive saris and went through the few lehngas he had brought with him without batting an eyelid and kept them aside, and carelessly tossed the ones they did not like into another pile. It’s that difficult second novel time for Hari Kunzru who made headlines when he was paid £1.25 million for the first. And it looks like he has produced a hit, writes Rachel Cook. HARI KUNZRU’S new novel, which is called — somewhat boringly, I think — Transmission, is very enjoyable. It implodes rather in the last 30 or so pages but still, up until that point, I couldn’t put it down. It is funny and wry; it is deftly plotted; its characters are intimately drawn. Most important of all, it genuinely seems to have something to say. In the hands of another writer, its concerns — globalisation, immigration, the strange and ravenous power of new technology — might seem earnest, dull, a real literary turn-off. I mean, why not just read Prospect magazine? In Transmission, however, these things are woven into the fabric of the story like fine threads of silver. After six frenzied but blissful hours of reading, I put it down and I thought (typical embittered hack): so much for the tricky second book, then. Kunzru received a sum approaching `A3 1.25 million for the UK, American and European rights to his first novel, The Impressionist, and, around the time of its publication, he was so predictably and so tediously hyped, there was every reason for assuming that he would soon disappear — yet another literary shout reduced to a whisper. For the truth is that however many long-haul air fares and pieces of groovy sixties furniture an advance buys you (I gather he likes Verner Panton), such immensely fat deals are more a curse than a blessing. Even if, by some miracle, the first book is a hit, the second is doomed. This, I’m afraid, is just the way it is, and Kunzru knows it. "Your head is on the block," he says. "You’re the bloke [man] who got the big advance. They’ve sold 100,000 copies of The Impressionist in paperback. But there is still a lot to prove." The Impressionist was a historical novel (its deadeningly elusive hero, Pran, is conceived during a monsoon in 1903) — one that, by Kunzru’s own admission, "addressed itself to a series of stereotypes the British have about the Indian novel". Transmission, on the other hand, is a resolutely 21st-century tale, a story of survival in a global economy where the local and the particular no longer have any meaning. Its two main characters, Arjun Mehta, a computer geek who has swapped India for Silicon Valley, and Guy Swift, a design-obsessed charlatan whose spurious London-based marketing business, Tomorrow, is "not so much an agency as an experiment in life", are making their way in this chilly universe with varying degrees of success until, one dark night, a virus named Leela (after a Bollywood actress, Leela Zahir) is unleashed on the networks of the world. Leela, it turns out, is both their nemesis, and their saviour. "Transmission is a more controlled piece of work," says Kunzru, when he comes to my house for lunch (we discover that we both live in east London so, ever the urban warrior, he cycles over). "The first book was me playing games. The characters were grotesques, and the central character had no interior life at all. In this book, I’m more involved on a human level with those I’m writing about." Hari Kunzru was born in 1969, and grew up in Woodford, a suburb in Essex, England. His father, an orthopaedic surgeon from Agra, and his mother, a nurse from south London, met in the hospital where they both worked. It was a controversial union. "He was the oldest son, so for him to marry outside our rather small and rather smug caste [his father is a Kashmiri-Hindu pandit], let alone someone who wasn’t Indian, was a big deal. There was opposition from his family. But when it became clear that they were determined, everybody accepted it." His mother didn’t meet her in-laws until Hari was two, when she finally went to Agra and stayed in the family’s sprawling manor house. "It was a very traditional household, right down to the plumbing," he says. "She found it really different and strange." She did not, and still doesn’t, speak any Hindi (neither does Hari, which he finds "sort of" embarrassing). Does he think people in Britain are racist? "Yes. But accepting that you grow up with prejudices is the beginning of overcoming them." Kunzru feels he has at least "another couple" of books in him and has signed up to deliver them, but he tells me — and I really do not think he is being disingenuous — that he worries about being a writer with a capital ‘W’. "I can see a version of my life where it all becomes meaningless. On a good day, writing seems noble. Other times, it’s narcissistic and pointless." But what would he do instead? Become a full-time computer geek? Devote himself to political agitation? "I have absolutely no idea," he says, dreamily. "In an odd way, writing is testament to my lack of imagination. I can’t picture what another kind of life would look like."